and what does it have to do with mixing? Selecting a mixer drive with a high horsepower rating doesn’t guarantee a satisfactory result in your application, and it doesn’t necessarily translate into a more powerful mixer either. Horsepower is merely a measurement of the rate at which work is done – or how much input power a motor has. Simply throwing more horsepower at an application may make a mixer’s impeller turn faster, but it will also drive down efficiency, negatively impact your budget, and can even damage your product through shear. If the driving force of a mixer is rotational, then horsepower is secondary to torque as the force that drives the pumping and performs the actual mixing. Therefore torque, or torque per equivalent volume, is what you are investing in when purchasing a mixer. Let’s take a closer look at torque and how it relates to mixing. What Is Torque? … Keeping It Simple. 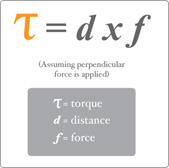 Mathematically speaking, torque is defined as the lever arm vector (distance) multiplied by the applied force vector (force), which tends to produce rotation on an axis. 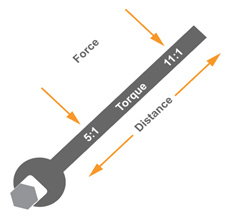 Torque can be explained through a simple demonstration of force applied to a lever. Given a standard amount of input force, a longer lever means a greater amount of torque generated. When using a tire iron to remove the lug nuts from a wheel, the amount of force generated determines how easily the lug nuts are loosened. As seen in the operation of any simple machine that involves a mechanical advantage, the length of the lever is particularly important. If you apply force close to the lug nut at Point A on the lever, you are unlikely to produce enough force to turn it. But, if you were to apply the same amount of force further away from the lug nut at Point B (thereby creating a longer lever), you will be able to crack the lug nut because the increased lever increases the amount of torque force. If greater force is created through distance, then a longer lever increases the twisting force exponentially, thereby multiplying the applied force and more easily releasing the lug nut. The same rule applies to a drive in industrial mixers. Why do we refer to “pumping” when we talk about mixing? Because pumping and mixing are close cousins, if not twins, in the process industry. Blending style mixers use an impeller just like a centrifugal pump. Rotating force, or torque, is transferred to the fluid to create motion within the application. Therefore, both pumping and mixing are often rated in gallons per minute. Each impeller type has a Pumping Number associated with it, and the pumping capacity of the mixer can be predicted through this value. However, pumping numbers are empirical and proprietary, and some mixer suppliers tend to overstate the pumping values of their mixers. On the other hand, Torque per Equivalent Volume is a standard and simple calculation of “Mixer Torque/Tank Size” that can be applied to any mixer configuration. Therefore the best measure of comparing mixer performance is by Torque per Equivalent Volume. When comparing mixer configurations, we can illustrate the difference between Pumping Level and Torque per Equivalent Volume – and reveal how more horsepower doesn’t necessarily translate into more torque or more pumping. As you can see by the configuration examples above, Torque per Equivalent Volume is the most accurate measure of the amount of torque your mixer can produce in a specific tank, and how it is applied. This is the measure you need to hold all you mixer suppliers accountable to when determining mixing value. What makes our application engineers so valuable is their deep understanding of the hard science behind The Art of Mixing: Specifically, the importance of gear reduction and the relationship between the impeller and the application.